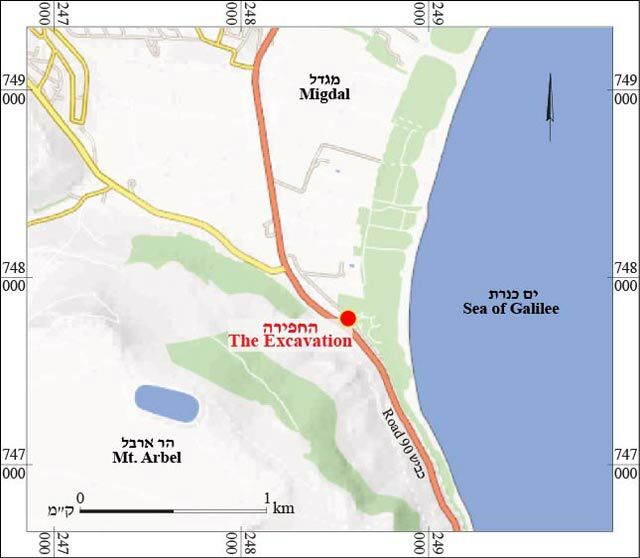 In November 2007, an excavation was conducted east of Highway 90, along the eastern side of the access road leading from Migdal Junction to Resital Beach (Permit No. A-5299; map ref. 248580–600/747753–73; Fig. 1), prior to the installation of an electric pole. 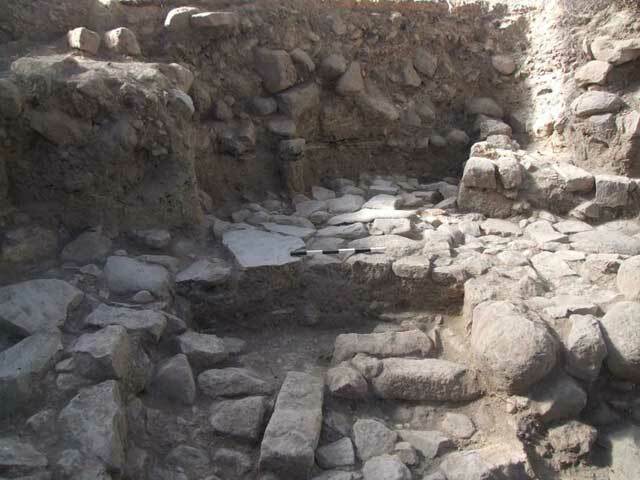 The excavation, on behalf of the Israel Antiquities Authority, was directed by D. Avshalom-Gorni, with the assistance of Y. Harel (area supervision), Y. Ya‘aqobi (administration), A. Hajian and T. Kornfeld (surveying), E.J. Stern (ceramics) and S. Haad (pottery drawing). Migdal is located to the northwest of the Kinneret, at the foot of the eastern slope of Mount Arbel. Migdal (Magdala) is mentioned in Christian sources, since according to Christian tradition it is the birthplace of Mary Magdalene (Mary the Migdalite). Christian sources state that in the eighth–tenth centuries CE, under the Muslims rule, a church stood at the site identified as the home of Mary Magdalene. During the early days of the Crusader Kingdom of Jerusalem, Abbot Daniel mentions the home of Mary Magdalene in his writings from 1106–1108 CE. However, no church is mentioned in any of the other twelfth-century descriptions by pilgrims, as these refer only to the geographic location of Magdala. In 1283 CE, Burchard of Mount Sion wrote about his visit to the home of Mary Magdalene. Several years later, toward the end of Crusader kingdom, the Italian monk Riccoldo da Monte di Croce (Ricoldus of Montecroce) arrived in Magdala and burst into tears of joy at the sight of the beautiful church that still stood there. During the Mamluk and Ottoman periods, the village of Magdala was mentioned just once, in 1626 CE; in this source, people claimed to have seen the home of Mary Magdalene, although by then the site was already a ruin (Pringle 1998:28). In the nineteenth century, Guérin and the members of the PEF survey described the Arab village of Majdal as comprising about thirty houses and eighty inhabitants (Conder and Kitchener 1881:361; Guérin 1984:137). The Arab village, which preserved the ancient name as Majdal, was situated within the boundaries of ancient Migdal, and existed until the War of Independence (for other historical overviews, see Avshalom-Gorni and Najar 2013; Cinamon 2014). A survey and several excavations were conducted in the past at the site. In 1971, Bagatti identified remains of a church and found a stone engraved with the year 1389 (Pringle 1998:28). Excavations conducted at the site since the early 1970s unearthed parts of the ancient settlement and determined the size of the settlement at different periods. The excavation results indicated that the settlement was established in the Hellenistic period (fourth century BCE) and continued to exist without interruption until the Early Islamic period (Avshalom-Gorni 2009; Avshalom-Gorni and Najar 2013; Cinamon 2014). 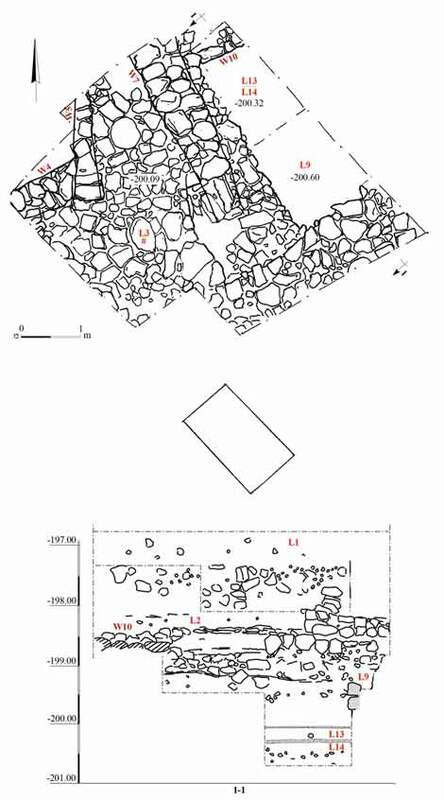 An excavation conducted slightly southeast of the current excavation yielded scant remains indicative of sugar production during the Crusader period and pottery vessels from the Mamluk period (Abu-‘Uqsa 2005). One square was opened (5 × 5 m; Fig. 2), and three strata were exposed: from the Mamluk period (3), from the Ottoman period (2) and a top soil layer (1). Due to the limited scope of the excavation, virgin soil was not reached. Stratum 3. A wall stump built of roughly hewn stones was exposed in the northeastern corner of the square. A layer of brown soil with several pottery sherds (L9) was found on the southern side of the wall. The ceramic finds included unglazed vessels, sugar vessels, cooking vessels and glazed bowls. The unglazed vessels are made of red, levigated clay and are well fired, which is characteristic of the pottery from this period in the north of the country; these include a thickened and everted rim of a krater (Fig. 4:1; Avissar and Stern 2005:84, Fig. 36:4, Type II.1.2.3). The sugar vessels are made of the same pale red clay and include conical sugar pots with a plain thickened rim (Fig. 4:2, 3; Avissar and Stern 2005:86, Fig. 37:5, 6, Type II.1.3.2), in which loaves of crystalline sugar formed, and molasses jars, into which molasses would drain, with an everted rim and no handles (Fig. 4:4; Avissar and Stern 2005:104, Fig. 43:8, Type II.3.1.6). Also found, were a jar with a tall neck, a folded-out rim and a prominent ridge on the neck (Fig. 4:5; Avissar and Stern 2005:102, Fig. 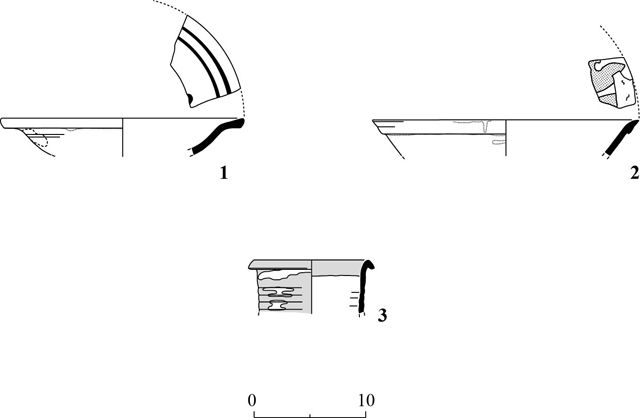 42:9, 10, Type II.3.1.4) and a rim of a jug with a carinated neck (Fig. 4:6; Stern 2014: Fig. 4:2). The cooking wares are made of yellowish-reddish clay; they include open vessels, one of which has a clear glaze on the inside (Fig. 4:7; Avissar and Stern 2005:97, Fig. 41:4, 5, Type II.2.3.3), and a closed wheel-made cooking pot of a type characteristic of the north of Israel (Fig. 4:8; Stern 2014: Fig. 6:12). Among the glazed bowls were vessels decorated with a green monochrome glaze (Fig. 4:9–11; Avissar and Stern 2005:12, Fig. 4:1, 2, Type I.1.4.1) and a yellow-glazed bowl with green splashes (Fig. 4:12; Stern 2014: Fig. 9:2). Many green and yellow glazed bowls decorated with crude incising were also found (Fig. 4:13–15; Yellow and Green Gouged Ware; Avissar and Stern 2005:16, Fig. 6:5–7, Type I.1.5.2). A very small body sherd of a carinated bowl that has a perforated ridge on the outside and green glaze and an incised decoration on the inside (Fig. 4:16). This bowl is a relatively rare vessel in assemblages in the northeast of the country; it is import from northern Italy and dates from the fourteenth–fifteenth centuries CE (Avissar and Stern 2005:72–73, Fig. 31:1–3, Type I.9.4). 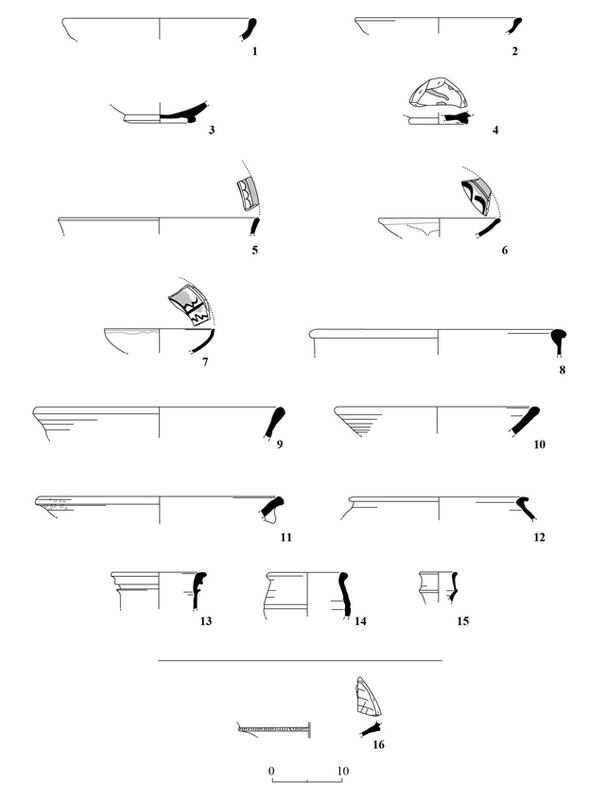 Interestingly, fragments of polychrome bowls (Graffita Arcaica) imported from Italy during the same time period were found in a previous excavation at Migdal (Abu-‘Uqsa 2005; Fig. 8). Apart from the vessels imported from Italy, the pottery assemblage from Stratum 3 is characteristic of the Mamluk period and the beginning of the Ottoman period (fourteenth–sixteenth centuries CE) in the north of the country. Similar assemblages were found at Zuq el-Fauqani (Hartal 2008a), Khirbat Sumeiriya (Stern 1999a) and at Khirbat Din‘ila (Stern 2014). Stratum 2. Remains of a corner of a building (W4, W5) and a wall (W7) can be ascribed to this layer. These walls were associated with three floors, one above the other: two tamped-earth floors mixed with crushed chalk (L2; Fig. 2: Section 1–1) and a basalt pavement (L3; Fig. 3). Judging by the ceramic finds, this stratum is dated to the Ottoman period (nineteenth century CE). Among the vessels found were very common glazed bowls imported from the Ottoman Empire: a Çanakkale Ware bowl from Turkey, with a ledge rim, a yellow-glazed background and manganese painting (Fig. 5:1; Vroom 2005:180–183) and a Didymoteichon Ware bowl that has a triangular rim decorated with slipped strips and yellow glaze that was imported from Thrace in northern Greece (Fig. 2:5; Vroom 2005:186–187). Also found was a Rashaya el-Fukhar type jar that originates from a workshop in the village of that name at the foot of Mount Hermon, where fine-quality vessels were produced and marketed throughout the north of the country (Fig. 5:3; Zevulun 1978). Stratum 1. Buildings of the Ottoman village and more ancient remains were damaged during the construction of the access road from Migdal Junction on Highway 90 to Resital Beach. The area was covered with earth containing medium and large fieldstones, as well as roughly hewn stones, a large amount of pottery sherds from the Roman period and modern refuse (L1). The origin of the soil covering is unclear; it may have been removed from elsewhere in the site at the time of the road construction. The excavation yielded remains of the village of Majdal from the Mamluk and Ottoman periods, which is mentioned in written sources. The excavation finds, particularly the architectural remains and the ceramics that date from the Mamluk and Ottoman periods, assist in understanding the location of the village. The pottery assemblage from the Mamluk period, which includes vessels that were used in the sugar industry and vessels that were imported from Italy alongside locally produced vessels, adds important information about the village during this period and offers us a glimpse of its inhabitants’ economy. The vessels from northern Italy and similar vessels from an earlier excavation at the site are an extraordinary find at rural sites in eastern Israel—evidence of visiting Christian pilgrims, who arrived at Magdala from Europe by way of ‘Akko harbor. Although there are no written references of the village as a pilgrimage site in the Mamluk period, it is reasonable to suggest that Christian pilgrims continued visiting the site during the thirteenth–sixteenth centuries CE. Judging by the vessels that were used in the sugar industry, it also seems evident that part of the village’s income came from growing sugar cane and from sugar production. Historical sources mention sugar production during the Crusader period in the Kinneret region (Peled 2009:192–203), and pottery vessels used in sugar manufacturing during the Crusader period (twelfth century CE) have been discovered at the site in the past (Abu-‘Uqsa 2005: Fig. 3:18–20). Although no such vessels typical of the thirteenth century CE were discovered, sugar production likely continued at the site during that century. Recent discoveries in the Kinneret basin indicate that during the Crusader and Mamluk periods it was home to a prosperous sugar manufacturing center thanks to the abundance of water and the climatic conditions that were favorable for growing sugarcane (Stern 1999b:83–88; Hartal 2008b; Zingboym and Hartal 2011; Cinamon 2012: Fig. 4:10–12). A similar phenomenon of continuous sugar production from the Crusader period into the Mamluk period was documented in the western Galilee, at Lower Horbat Manot (Stern 2001:277–308) and at Umm el-Faraj (Damati 2011). Although the installations that are characteristic of sugar production – a sugar works, millstones, a press, ovens and water basins – were found neither in this excavation nor in others at the site, it seems that the ceramic vessels indicate the production of sugar crystals at Migdal. It is possible that the sugar works was located in the opening of Wadi Hammam, near a source of water and fields of sugarcane in the valley. The importance of this excavation is in understanding the size of the settlement during the Mamluk and Ottoman periods, as well as in the finds that are associated with the sugar industry at the site. Abu-‘Uqsa H. 2005. Migdal. HA-ESI 117. Avissar M. and Stern E.J. 2005. Pottery of the Crusader, Ayyubid, and Mamluk Periods in Israel (IAA Reports 26). Jerusalem. Cinamon G. 2014. Migdal. HA-ESI 126. Damati E. 2011. A Sugar Industry Site from the Fatimid to the Ottoman Periods at Tell Umm al-Faraj, Western Galilee. ‘Atiqot 65:139–159 (Hebrew; English summary, p. 77*). Guérin V. 1985. A Geographic, Historical and Archaeological Description of the Land of Israel 6: Galilee (1) (transl. from the French by Haim Ben-Amram). Jerusalem (Hebrew). Hartal M. 2008a. Zuq el-Fauqani. HA-ESI 120. Hartal M. 2008b. Tiberias, Galei Kinneret. HA-ESI 120. Peled A. 2009. Sugar in the Kingdom of Jerusalem: A Crusader Technology between East and West. Jerusalem. Pringle D. 1998. The Churches of the Crusader Kingdom of Jerusalem: A Corpus II: L–Z (excluding Tyre). Cambridge. Stern E.J. 1999a. The Pottery of the Thirteenth–Fifteenth Centuries CE from Giv‘ay Yasaf (Tell er-Ras). ‘Atiqot 37 (Hebrew, pp. 125–136; English summary, p. 174*). Stern E.J. 1999b. The Sugar Industry in Palestine during the Crusader, Ayyubid and Mamluk Periods in Light of the Archaeological Finds. M.A. thesis, Hebrew University of Jerusalem. Jerusalem (Hebrew; English summary, pp. a-h). Stern E.J. 2001. The Excavations at Lower Horbat Manot: A Medieval Sugar Production Site. ‘Atiqot 42:277–308. Stern E.J. 2014. The Crusader, Mamluk and Early Ottoman-Period Pottery from Khirbat Din‘ila: Typology, Chronology, Production and Consumption Trends. ‘Atiqot 78:71–104. Zevulun U. 1978. The Pottery of Rashaya el-Fukhar. In S. Applebaum, S. Dar, Y. Peleg and Y. Ruth eds. Mt. Hermon and its Slopes: Collected Essays. Tel Aviv. Pp. 190–197 (Hebrew). Zingboym O. and Hartal M. 2011. Tiberias. HA-ESI 123. 3. A stone floor (L2, L3) dating to the Ottoman period, looking west. 4. Pottery from Stratum 3.